Cakes, especially layer cakes, normally contain a combination of flour, sugar, eggs, and butter or oil, with some varieties also requiring liquid (typically milk or water) and leavening agents (such as yeast or baking powder). Flavorful ingredients like fruit purées, nuts or extracts are often added. Cakes are often filled with fruit preserves or dessert sauces (like pastry cream), iced with butter cream or other icings, and decorated with sugar and almond meal, piped borders or candied fruit. 1.Mix everything together until the consistency is smooth. 2.Pour into a well greased microwave heart shaped ring cake tin. 3.Cook on high for seven minutes. 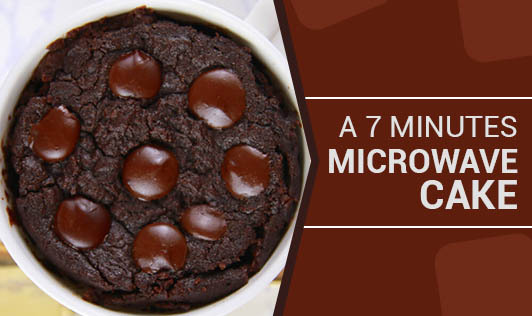 4.If you have a microwave that isn’t powerful enough, cook for eight minutes. 5.When cooled, ice with chocolate icing. 6.Arrange it with strawberries and garnish it with cream for making it more colourful.